First on the list was some cracker engineering. A three-wheel recycled cardboard pulley system to be exact. The Babe had fun experimenting with how the different wheel configurations changed how easily the cup full of Goldfish crackers moved. 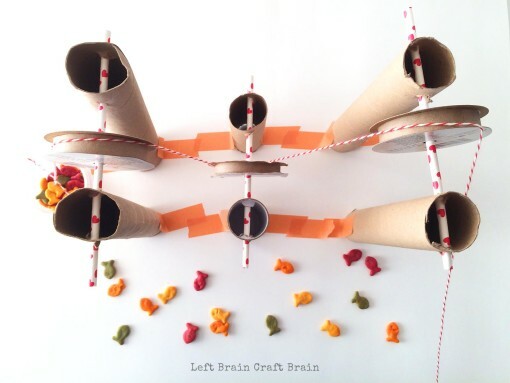 Playing with this (and making the crackers spill up over the top!) was about as deliciously fun to her as the crackers. 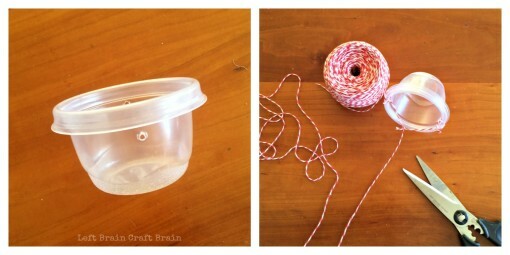 Make the pulley basket: Take the plastic cup and poke two holes in it, directly across from each other. Feed twine through each hole and tie, giving the cup a short handle. Then tie a 1 1/2 yard piece of twine to the center of the cup handle. 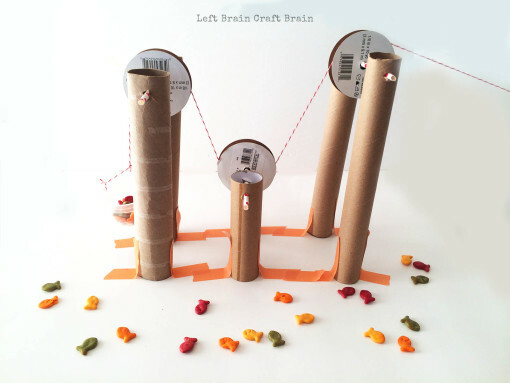 Cut paper rolls to desired lengths. 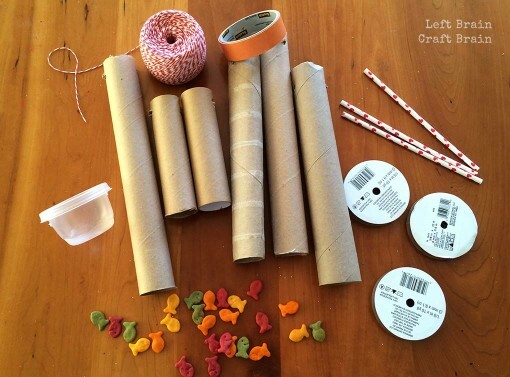 I used 4 at paper towel roll length and 2 at a shorter length. Poke a hole into one end of a paper roll, approximately 1″ from edge. Poke another hole, also 1″ from edge, directly opposite the circle from the first hole. Make holes large enough for a straw to fit easily through. Repeat with the remaining five rolls. Take two matching height rolls. Feed a straw (the pulley shaft) through both holes in a roll, then the hole in a ribbon spool and then through the second roll. Repeat with the other two sets of rolls. 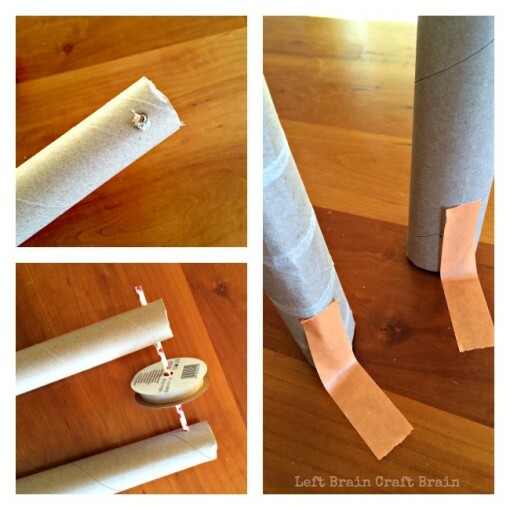 Tape the bottoms of the paper towel rolls to a stable table with masking tape. The rolls should be just narrower than a straw’s length apart. Then tape the next two pulleys. 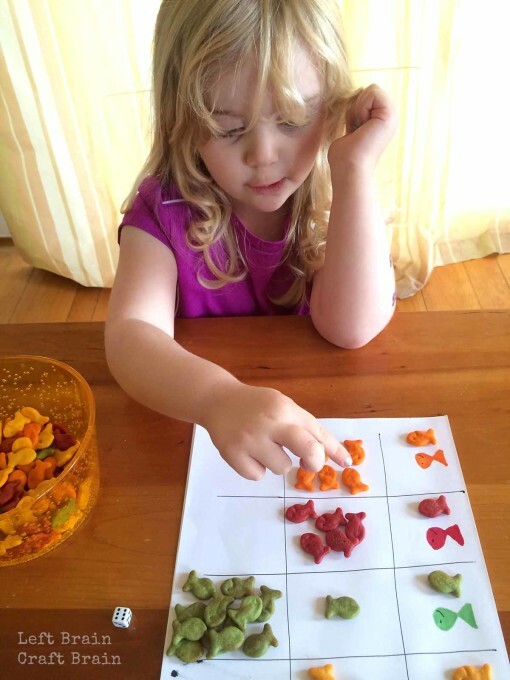 Next up is a little snack math… The goal of this activity is to practice a few basic math skills while having some tasty fun. Kids will count, color sort and practice their dice skills. Game rules: The first person to collect 20 Goldfish crackers and have at least one cracker in each color wins. 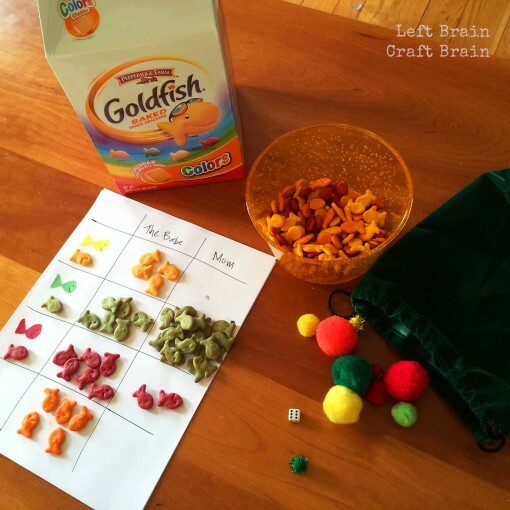 Players gain Goldfish by rolling the die and picking a pom pom from a bag. Players then grab as many crackers as the die says in the same color of the pom pom they chose. Draw the game scorecard by dividing a sheet of paper into 3 columns and 5 rows. Label the rows with the four colors of Goldfish crackers (red, yellow, orange & green). I drew a colored cracker on each of the rows, but my daughter preferred to use a real cracker to label them. Then label the columns with the player’s names. 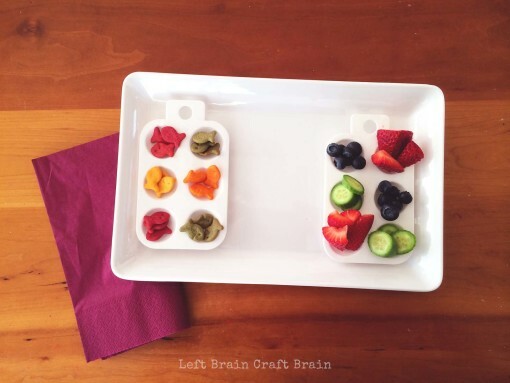 Want the kids to have a smaller snack? Have them play to 10, not 20. Are they really hungry? They could play to 55, which is one serving of Goldfish crackers. Another way my daughter enjoyed of the Goldfish Cracker STEAM Snack was to do a bit of art. Specifically some mosaic making with fruit and vegetables. 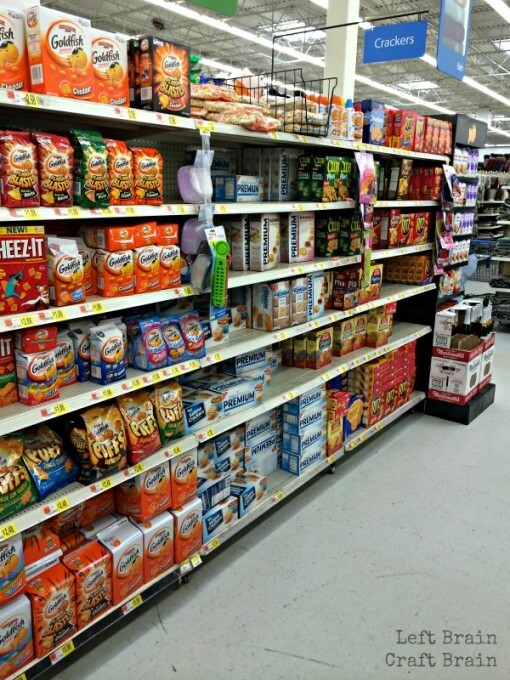 Other snack food like fruit, cheese, vegetables, etc. Set out their supplies and let them have it! When we did this art snack, The Babe was pretty hungry. So the ratio of creative mosaic making to eating was actually quite low. But she loved it nonetheless, especially having lunch served on an artist palette. 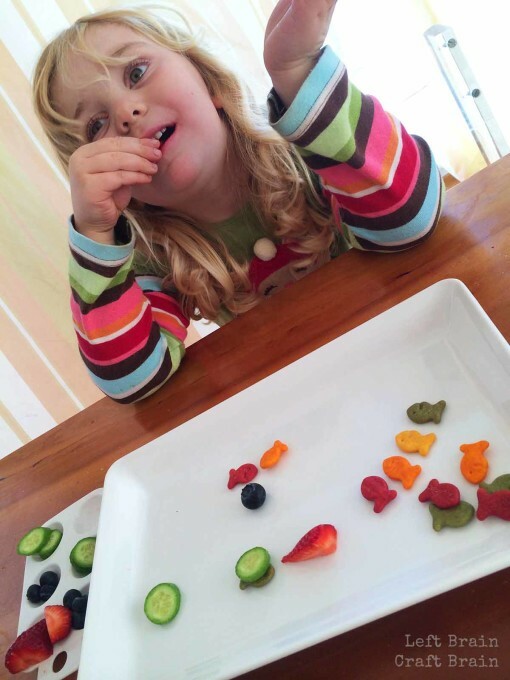 Food can be a challenge for both kiddos and parents. I’ve got a picky preschooler on my hands, but a few of those colorful Goldfish crackers always brings a smile to her face. 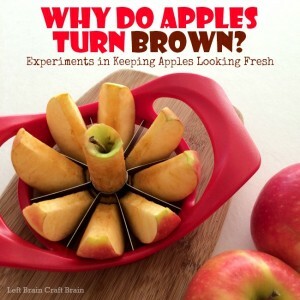 They make a great snack, a great way to play & a great way to learn. Plus I love that they contain natural ingredients like paprika and watermelon to give them their fun colors instead of those numbered colors that we try to avoid. Luckily for me, Walmart has them on rollback right now for $5.98. Because that pulley holds A LOT of Goldfish crackers. Check them out on Facebook or Twitter to find new recipes and fun things to do with Goldfish crackers. 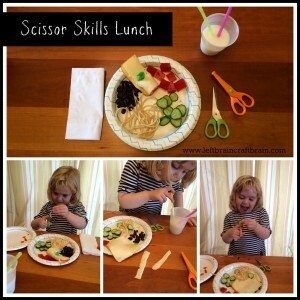 What a great way to play with your food! 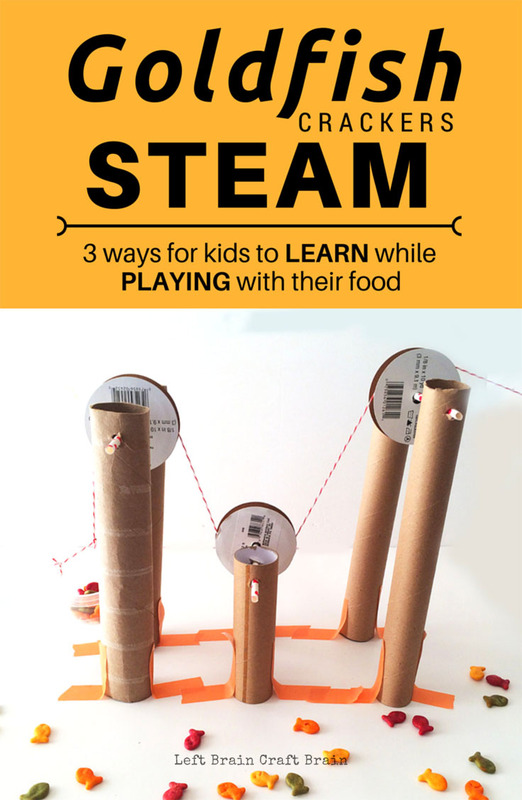 My kids will love these ideas. Thanks! Thanks so much Erin! Hope your kids have fun. Very cool! My kids will love this!Very cool! My kids will love this! :) :) :) :) :) !!! This looks like SO MUCH FUN Anne! We are definitely going to make one of these tomorrow. Onetime loves anything to do with pulleys/gears etc. and is going to flip out for this! We may just have to get some crackers too LOL! 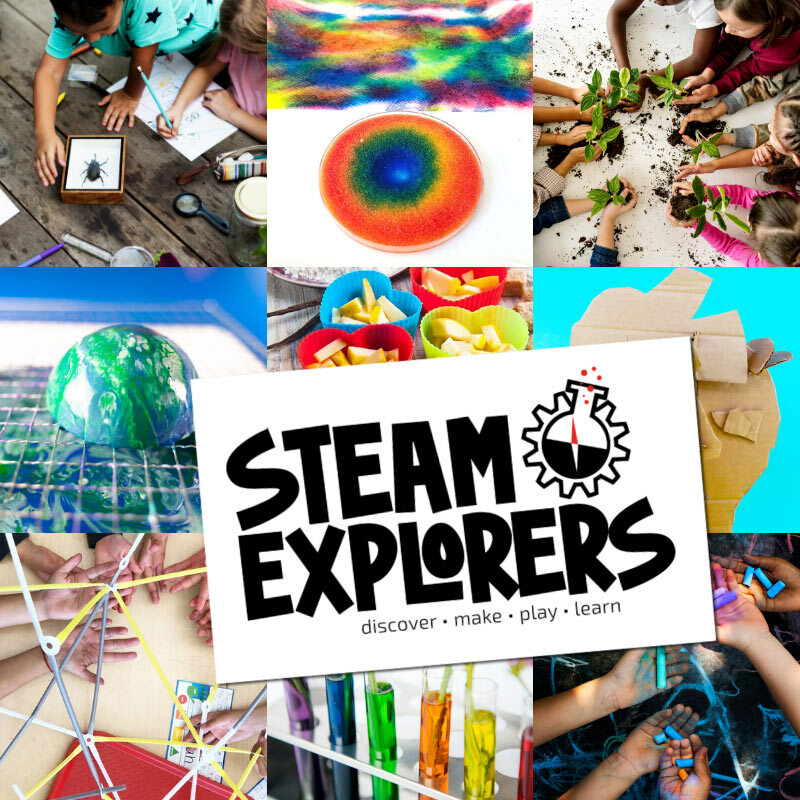 My 7 year old is very “scientency” and will love this activity this summer! Sounds so cute! Hope you had fun.